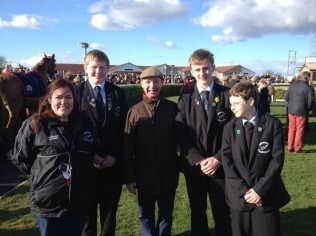 A number of boys were given the opportunity to visit Wincanton Racecourse for a Food and Farming special race day on Sunday 23rd March. With a number of high profile jockeys, such as Richard Johnson and Robert Thornton, in attendance alongside local trainer Paul Nicholls it gave the boys a chance to really soak up the atmosphere and rub shoulders with the horse racing world. Three boys were also able to enter the parade ring to choose the best turned out horse and after the race presented the trophy to the winning trainer.